Djs-inthemix provides mobile DJ services for all your event needs no party is too small or to big . Finding a DJ is easy, but finding the RIGHT DJ is harder. 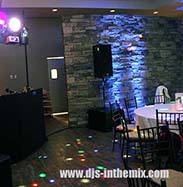 Djs-inthemix carries a massive music selection that covers a wide range of music styles to satisfy any diverse crowds. The music is the key to a great event. And Djs-inthemix is here to satisfy that need. With your help we can put together the prefect playlist for your special event. Give us a call or email us with no obligation.